Stairways, Inc.’s standard spiral stair kits are available in the standard diameters of 40”, 48”, 52”, 60”, 64” and 72”. All standard diameters are kept in stock. Standard spiral stairs can be produced in diameters that are in-between standard widths or larger than standard widths. The photo shown here is a standard spiral steel stair kit in a 7’ diameter. 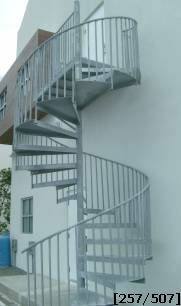 Our customer for this spiral stair is on a Caribbean island that had a fire escape application on a condominium project. Stairways, Inc. adapted our standard spiral stair kit to this diameter, while also meeting the IBC Code. Being in the Caribbean, galvanization was used to protect the steel against high salinity and moisture. A long landing was designed to move the center of this spiral staircase away from a parking area. For this customer, this was a good design and model choice; it was an inexpensive and practical installation.